A group of Upper West Side tenants is crying foul after a building inspector found false statements on permit applications to build luxury condominiums directly above a rent-stabilized building. The applications certify there are no rent-stabilized occupants on the construction site, even though dozens of rent-stabilized people have lived at 711 West End Avenue for decades. But Paul Boardman, a member of the development team, said it is correct to say there are no rent-stabilized tenants on the site -- because the site of the luxury condos will be completely independent from the low-rise building below. "I would look at that document and say that's 100 percent correct," Boardman said, referring to one of the work plan applications. To make the two buildings structurally independent, developers plan to erect a giant platform hovering above the low-rise building below. That platform would support the entire load of the luxury condominium tower. "I've challenged my professionals to design something that is seismically separate," Boardman said. Boardman said the development team would correct the applications if the violations are upheld during an administrative appeal. But he stressed that his team has filed hundreds of documents, including a tenant protection plan and a certificate of occupancy, that make clear tenants will be occupying the building during construction. “I have disclosed, and I think the sum and substance of the 1,250 page documents that have been there, articulate that that building is occupied and articulate how we are going to design around that building,” Boardman said. In order to allow the future condo owners access to their apartments, the developers successfully persuaded the occupants of six rent-stabilized studio apartments to vacate. Their line of apartments will serve as the elevator shaft and stairwells connecting the ground floor to the luxury condos above. The New York Division of Homes and Community Renewal is the state agency that oversees rent regulation laws. Charni Sochet, an agency spokeswoman, did not say whether developers at 711 West End Avenue should have disclosed to DHCR the planned renovations. In a statement to the I-Team, Sochet did say "if the renovations will de facto create a building-wide modification or reduction in services, the owner must file an a 'Application for Modification of Services'" with DHCR. According to the development team, there was no requirement to notify DHCR about the project. “They’re putting every one of us in jeopardy in the building, and for the sake of non-affordable housing," said Warren Jones, a concert pianist who has lived at 711 West End Avenue for three decades. Despite vocal opposition, there are some rent-stabilized tenants who support the construction project over their heads. Tina Solazzo and Roger McClean live on the top floor of the lower building. They're looking forward to upgraded windows, air conditioners, and a community garden that will come along with the new condos. The two buildings will also share a renovated lobby. "I'm excited for the capital improvements with the lobby, because it's kind of tired looking," Solazzo said. But the tenant association is convinced the risks and inconvenience of living below a construction zone outweigh the benefits. In a summary report, an engineer hired by the tenants association warned that drilling down into the earth below the building to anchor the platform columns could have a potential “catastrophic effect” on the lower building's foundation. "The engineer is really my expert when it comes to this, and he doesn't see how it can be done with people in residence," Cooper said. Dominick Pilla, an architecture and engineering professor at City College said the tenants do have legitimate concerns about structural stability, but "build-over" projects like this have been done safely. They are just more time consuming and expensive. "This can be done," Pilla said. "But there are risks. There are more risks than building new construction." Alexander Schnell, a spokesman for the New York City Department of Buildings, sent the I-Team a written statement saying developers would be held to a high standard. Ray Dovell, the architect of the luxury condo project said extensive precautions are being taken to protect the existing building including bracing and shoring its foundation. 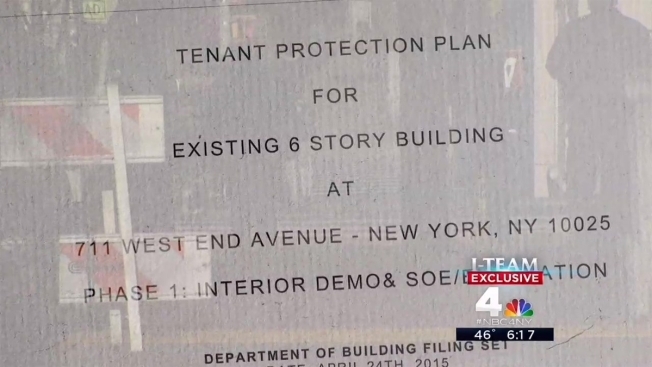 Developers have also filed a tenant protection plan. Instead of digging with pile drivers, they plan to use smaller hand tools like jackhammers and drills to reduce vibration. "We’re not going in with giant machinery and hammering this building to pieces," Dovell said.